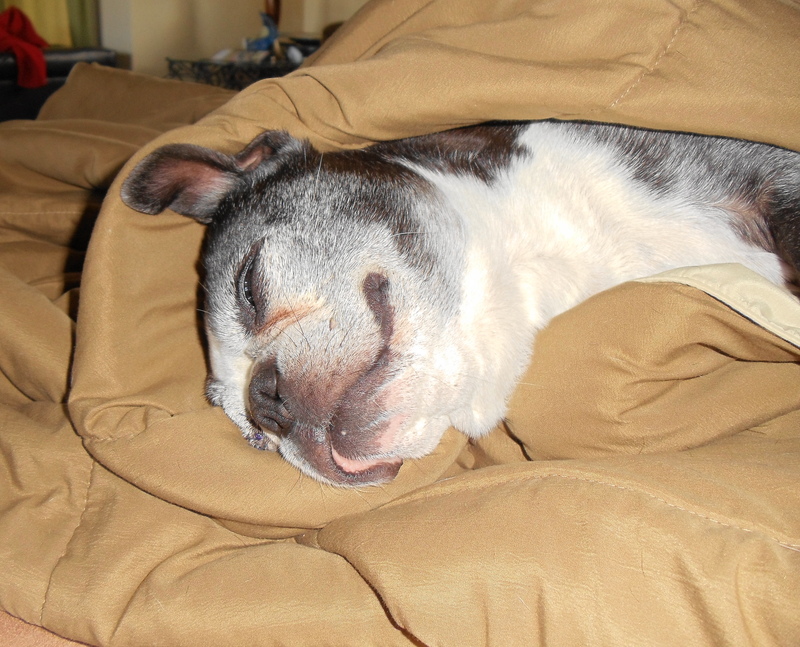 Leo enjoyed sleeping in today…he always looks like he is smiling while he is sleeping. Leo snuggled himself in and snored and snored and SNORED. Leo’s healing is still going well. 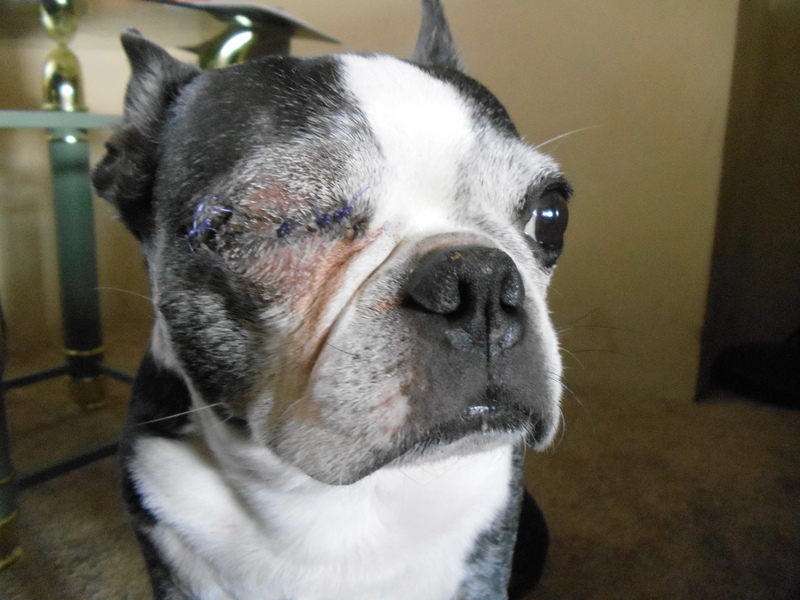 Another one of his little sutures came untied this morning, but thankfully the eyelids are still holding together and vet says not to worry. You can see that the bruising is getting better and swelling is going down. 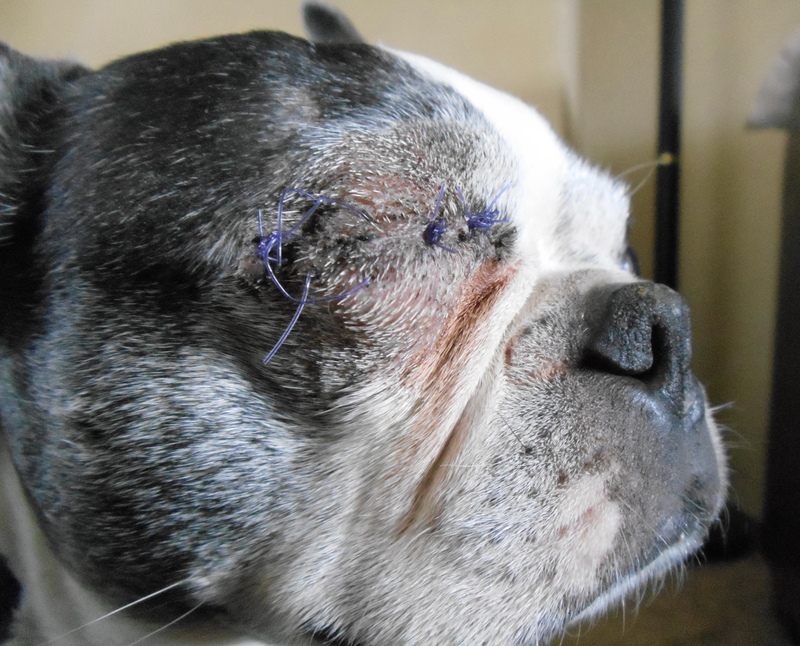 Leo’s eye area 5 days post surgery. Leo is in very good spirits today, full of energy (probably due to the sleeping in and super long nap) and wanting to play. It is so great to hear that Leo’s recovery is going well so far. He looks very happy and in far less pain than he was previous to surgery. I’m sure others who read about Leo on bterriers.com would love an update (I wanted to find out how he was doing so I did some googling, but others might not think to research!) so if you have time, please let everyone know how this handsome boy is doing. 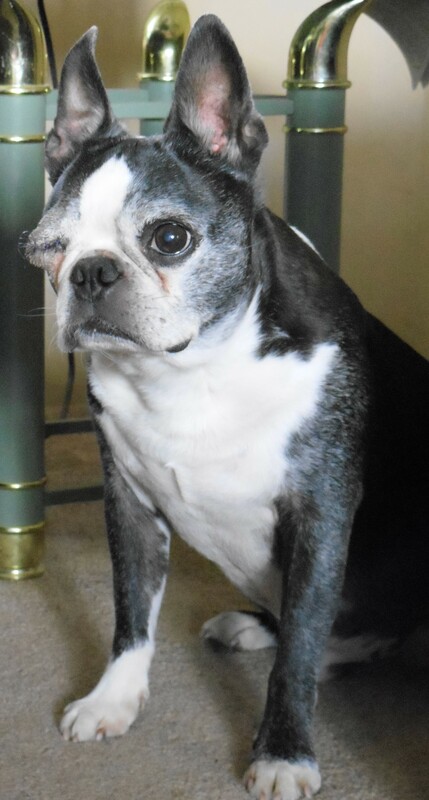 Sandra, big sister to Abbey and Lucy, two pretty Bostons out west. Thank you…I had not even thought about doing that. Figured that giving the daily updates here would work, and I have been sharing on Pinterest and Facebook. 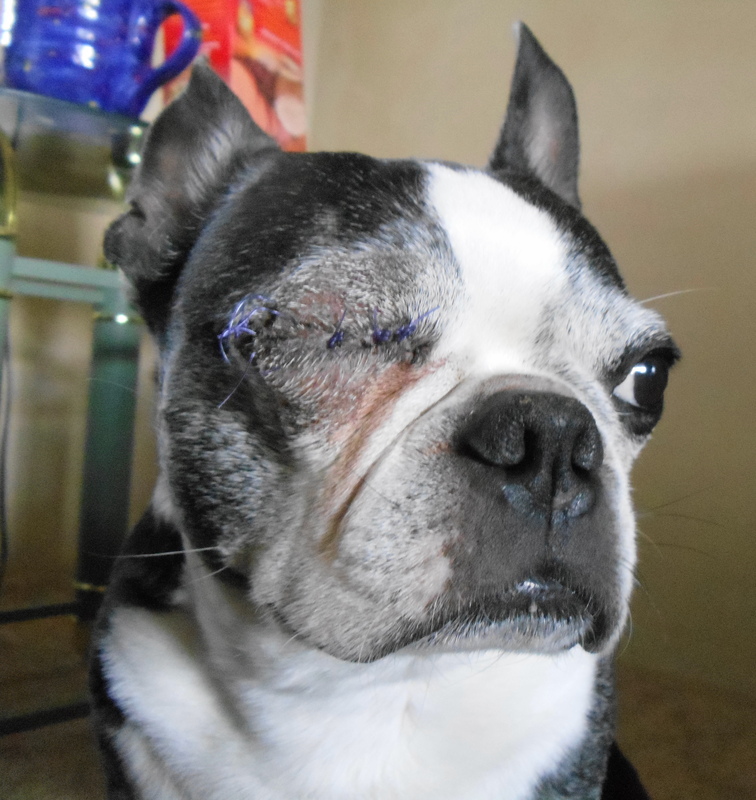 Will write up a little thing for bterriers.com that way everyone who has been following his story can. Thank you Sandra, Abbey & Lucy. Leo loves knowing he is being supported through his healing (and before his healing). 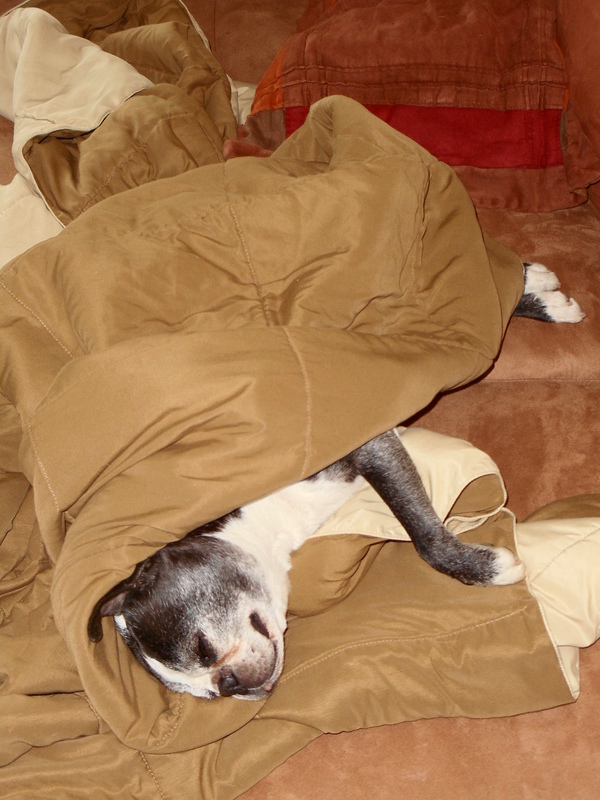 I’ve been posting to the blog each day with Leo updates. It is amazing seeing his progress and seeing his healing. I hope that if/when another family has to go through the same thing the blogs that show what to expect will help make it less scary. 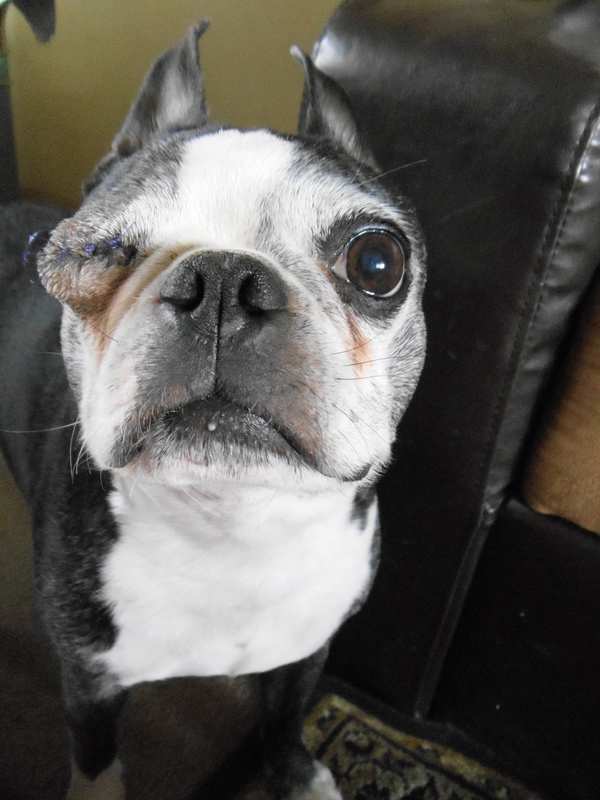 I had read a couple of blogs where it showed the dog a few days after surgery and then a few weeks later…and I was worried about the day to day and what to expect. 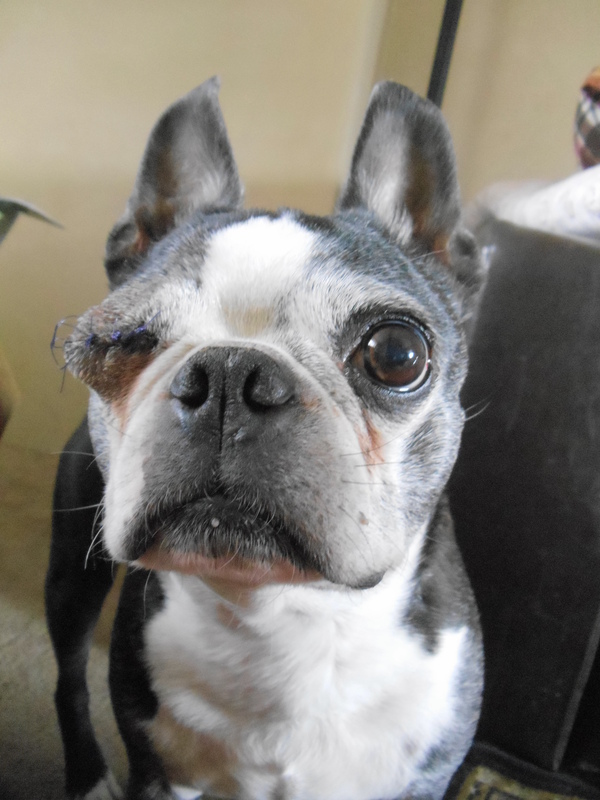 My dog just had both eyes removed yesterday afternoon around 4pm. He came right home after the anesthesia wore off. He is in horrible pain. How long does this horrible pain last? How long before they stop being afraid to move? Oh goodness. That sounds very hard on your dog. I can only imagine how much he is hurting. Leo’s vet that did his surgery actually kept him overnight to keep him on iv pain medication and antibiotics and to monitor to make sure he was okay. Part of why they did this was due to is age at the time of the surgery. We picked him up the day after his surgery and you could tell that he was very sore, but that he was relieved to be home. His vet had us give him pain meds twice a day for a few days after his surgery. Leo of course was on oral antibiotics too for about a week. In Leo’s case you could tell he was starting to feel better and wanting to play by day three, but we had to discourage him from being too active. Was your boy able to see at all prior to his surgery? How old? How is he doing today?